AS A PROVINCIAL commodity organization it is our job to provide value to our farmer-members and help to ensure a strong future within the grain industry. To do that effectively, we need to have a much broader representation than just at the local and provincial levels. It is important that we establish and maintain strong relationships at the national and international levels. We put a lot of focus on communicating our government relations, research and market development activities. The results we achieve in these areas are tangible and easily tell the story of how we are directing your check-off fees. We can point to the Ontario government’s commitment to consult on a 2% bio-diesel mandate (we are hopeful this will be implemented in the next provincial budget), the creation of a Professorship in wheat breeding at the University of Guelph, and an investment in more than 60 agricultural research projects, as just a few results we have achieved over the past year. Agriculture and Agri-Food Canada (AAFC) Seed Sector Value Chain Roundtable – This group is comprised of industry members, including seed growers and Crop Life Canada, and representatives from government agencies, including the Canadian Grain Commission and Canadian Food Inspection Agency. AAFC Grains Roundtable – This roundtable was formed in 2011 to build on the success of the Grains Innovation Roundtable which had reached the end of its mandate. The goal of this group is to strengthen the competitiveness of our industry. 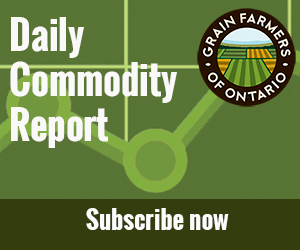 Canada Grains Council – This organization brings together producers, crop input companies, grain companies, processors, end users, and government to co-ordinate efforts to increase the sale and use of Canadian grain in domestic and world markets. Canadian Renewable Fuels Association (CRFA) – Grain Farmers of Ontario is an Associate Member of this association which promotes the economic and environmental benefits of biofuels and guides research into future biofuels. They are comprised of representatives from renewable fuel producers, fuel technology providers, industry technology and equipment suppliers, car manufacturers, petroleum producers and industry feedstock suppliers. Canadian Field Crop Research Alliance (CFCRA) – CFCRA is a not-for-profit entity founded in 2010 with an interest in advancing the genetic capacity of field crops in Canada. CFCRA has been an effective alliance of provincial farm organizations and industry partners.